These are letterpress foil business cards from our exclusive bespoke “Individual” range, printed on duplexed white and dark grey natural-grained (uncoated) card @ 540gsm – card of a thickness less than 540gsm is too thin for the bespoke processes that we use. 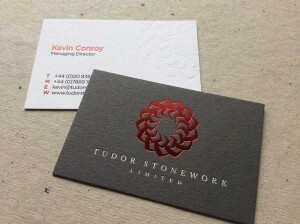 The front (white side) of the card was printed with matt dark grey foil to complement the reverse card colour, as well as a metallic red foil. The front also has a blind deboss to give additional texture and an extra dimension and sophistication to the card. The dark grey side of the card is printed with the same metallic red foil as the front for the logo, and a satin silver foil for the text – satin silver can be a more subtle and sophisticated option to e.g. a white foil, for some designs. This order was a multiple order of 7 sets of 250 business cards for various staff members in the company – multiple orders like this can be surprisingly cost effective for these very special bespoke business cards.